A lot of interesting things can be found in a pile of firewood. Besides the insects and other critters we had in the log pile earlier this winter, Dan has also found my carpenter ant tunnels, and my mom recently discovered a Red Squirrel nest. And then the other day, while collecting an armful of logs for the fire, I discovered a few of them were covered with intricate black tracings. I puzzled over these for a few moments until I noticed in one spot several of them all came together into one thick line. Or, looking at it the other way, one thick line branched off into several. I’m fairly certain that these are the mycelium of a bracket fungus that would have been growing on the exterior of the trunk. The mycelium is the fungus’s equivalent of a root network, tendrils that extend deep into its growing substrate (be it log or soil or something else). It’s the part of the fungus that’s active in decomposition; the part that we typically observe and think of as the fungus is simply its means of spreading its spores for reproduction. 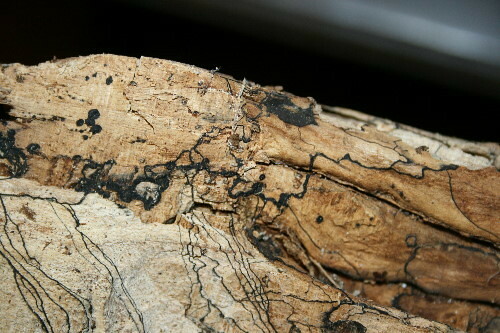 The black mycelia weren’t just restricted to the outside of the log. 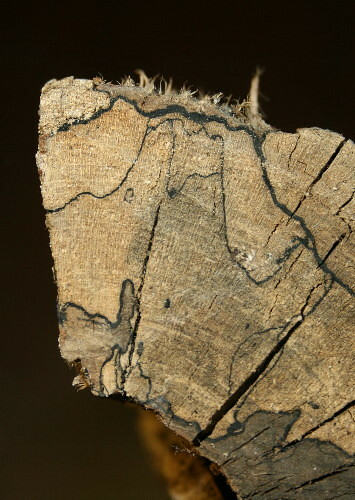 There were more tracings along the sides, and when I examined the cut end, it was possible to see where the network extended through the wood into the tree’s interior. I’m curious as to whether the mycelium follows a path of least resistance as it grows, which would take it through the tree’s “veins” (the system of tubes that carries water and nutrients from the roots to the branches) and between the annual rings of growth, I would think. In some spots of the cross-section the black lines do look like they’re following this sort of pattern, but in other spots it just seems random. I don’t know that there’s any way to tell simply from this which species of fungus was growing on the tree (I don’t even know what type of tree it was; the bark had long since been shed). Still, I found it pretty interesting simply to be able to see the network of mycelia, something that’s normally hidden out of sight. I did a Google image search to see if I could find other photos of mycelia in logs. I didn’t really find what I was looking for, in part because I got distracted by this video. This is a computer simulation that someone wrote based on the growth patterns of fungal mycelia. Instead of decaying material, though, the “food” his electronic mycelia gravitate toward is the light areas of photographs. He supplies a photo to the computer program, and the program simulates the growth of the mycelia based on which parts are light and which are dark, with the densest growth in the lightest parts of the photo. At first it really does look like roots growing… (easier to see at full size at the video’s page). Pretty neat! Pretty cool! Mycylium is something that has an almost cult-like following among the interested, with books like Mycylium Running: How Mushrooms Can Help Save the World. Lord knows, we can use all the help we can get! How very interesting. I haul a couple wheelbarrow of firewood every day. Today I will look for our own mycellium. This is very interesting, you make me think of things never thought of before. Or for that matter looked at before. This is utterly beautiful. I love your website/blog; Jolina Petersheim (@Jolina_Joy) shared your site with me, thinking our blogs were of a similar vein. So glad to have found you! Gorgeous photos! I’ve seen these, but never paid attention. I sort of put the lines down to watermarks, and left it at that. Now I’ll be on the lookout for them. What amazing rewards for looking closely at common things! Firewood can be very distracting. Many times cutting, splitting and/or hauling end up including photo sessions. Like Susannah, I also thought it was something like water-staining. I love learning when I’m wrong.